If you look at the night sky with the naked eye you may think that nothing lies in the space between stars. This is, however, far from the truth. Interstellar space, that is, the space between stars, is filled with exceptionally rarified matter in the form of tenuous gas and tiny dust grains, extremely energetic particles known as cosmic rays, starlight, and magnetic fields. 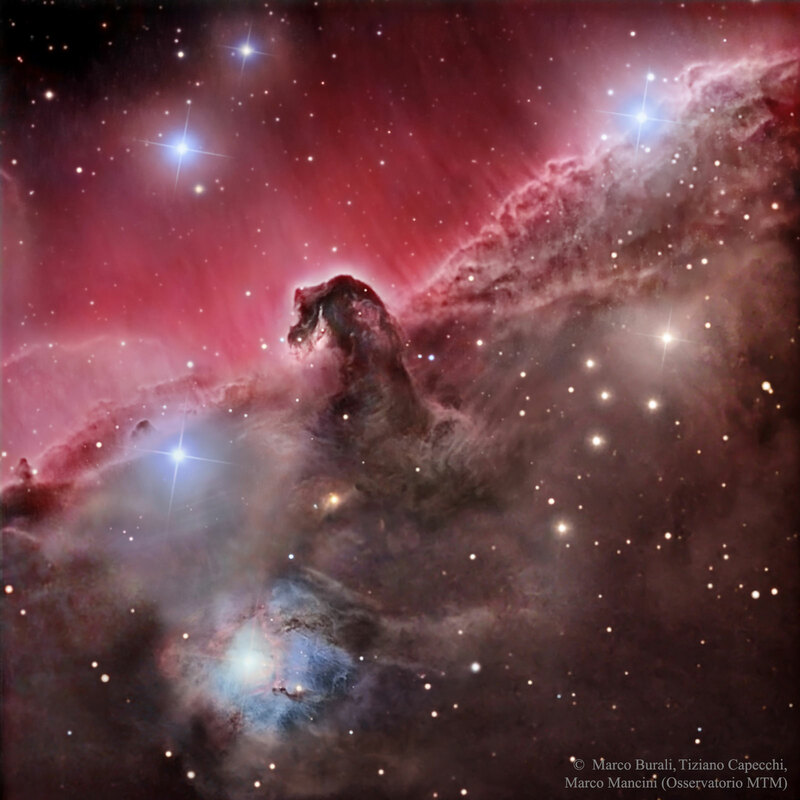 The horsehead nebula, a magnificent interstellar dust cloud in the constellation Orion. These elements are not only of utter importance because they are what new stars are made of, but they are also the main source of gamma rays detected by Fermi. Indeed, cosmic rays can smash gas atoms or give a powerful kick to starlight, producing as a result a gamma ray. You may want to look at this post if you want to know more about the processes that can produce gamma rays. You can see how deeply gamma-ray emission is related to what is going on in interstellar space if you compare the map of the sky from Fermi with the map of the sky from the Planck satellite, that detects, among other things, emission from space dust in infrared. 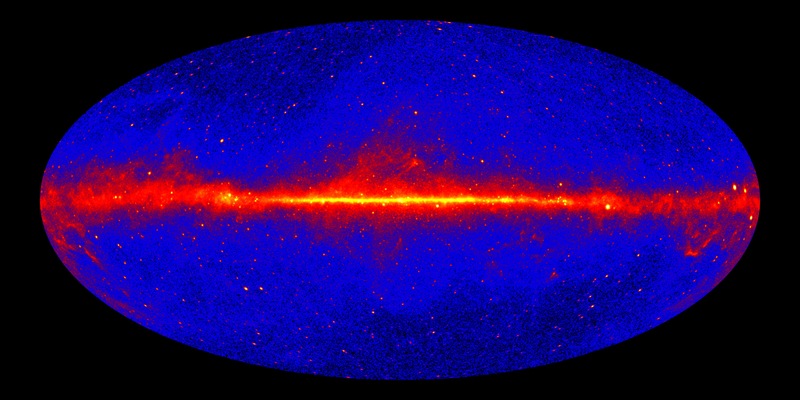 The gamma-ray sky seen by Fermi. Credit: NASA/DOE/Fermi LAT collaboration. The Infrared/microwave sky seen by Planck. Credit and copyright: ESA, HFI and LFI consortia. Both maps show a bright band along the center, that corresponds to the disk of our own Galaxy, the Milky Way, and outline the profile of some closeby interstellar clouds like those in the Orion and Taurus constellations. Interstellar emission is a sort of fog that we need to pierce through in order to find in Fermi data the objects that emit gamma rays like pulsars or active galactic nuclei. Therefore, modelling interstellar emission is an essential part of many Fermi data analyses. At the same time, we can use interstellar emission to learn about the history of cosmic rays wandering through the Milky Way, and the gas and dust they encounter making them shine in gamma rays.